Herald readers have been too polite so far, but I’ll say it. Bogan-land is a borderless area occupied by Daily Telegraph readers. I'm not sure if Mr Carruthers has picked up a copy of the Tele in the last decade, but as someone who reads three newspapers daily, I can say that had he read today's he would have seen every single one of the letters therein were far more relevant to the readership than the banal attempts at wit filling space in the Silly. Yes, ten years ago the Tele was typically full of spelling errors in the brief section that wasn't the sport of the form guide. However many remaining Herald readers seem to have missed the substantial decline in calibre of that publication over the years. Meanwhile, startup lefty publication The Saturday Paper has (literally) plastered these signs all over the inner-city. 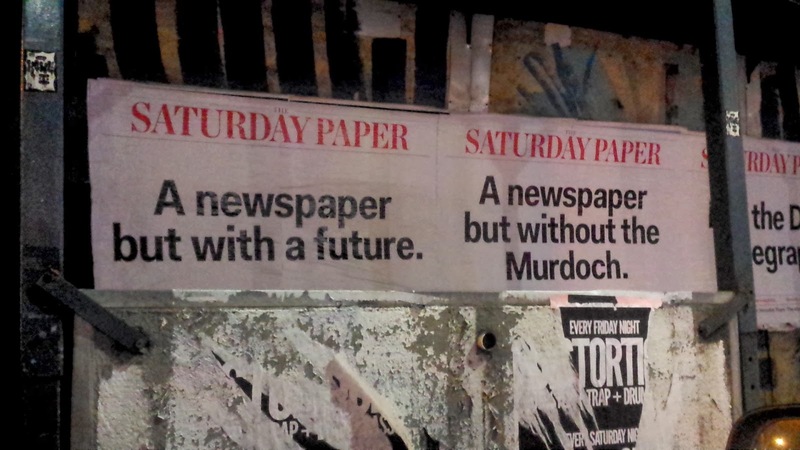 Murdoch runs newspapers without the vandalism of private property.